But this weekend’s victory at the Curler’s Corner Autumn Gold Curling Classic in Calgary may have been their most impressive yet. 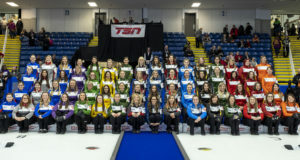 The fourth WCT championship included wins over some of the world’s best teams including Ottawa’s Rachel Homan and Winnipeg’s Jennifer Jones. Einarson, Val Sweeting, Shannon Birchard and Briane Meilleur qualified through the C event after losses to Calgary’s Laura Walker and Homan. They’d earn their revenge on Homan in the semifinal, and took down Jones in the championship final with a 7-5 win. Einarson and her crew cashed a cheque for $13,000 and earned some major points on the Canadian Team Ranking System. Jones took home $9,000 for her runner-up finish, and semifinalists Homan and Tracy Fleury (East St. Paul, Man.) earned $6,000. 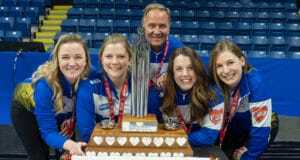 In Toronto, it was another Manitoba squad taking home the top prize at the Stu Sells Toronto Tankard. Reid Carruthers, Mike McEwen, Derek Samagalski, and Colin Hodgson (Winnipeg) defeated Stuart Thompson (Darmouth, N.S.) 6-5 in an extra-end final. Their first event win of the season follows a runner-up finish at last week’s Elite 10 Grand Slam, and earned the Carruthers team 55.345 points on the CTRS and the big portion of the $42,000 purse. Thompson, who won The Curling Store Cashspiel in Lower Sackville, N.S., two weeks ago earned 40.586 points. In the women’s event in Toronto, a surprise winner was crowned as Kira Bruton, a junior team from Sudbury, Ont., defeated Cathy Auld 7-4 in the final. Bruton, who won a junior Stu Sells event last month, defeated Regina’s Kristen Streifel in the quarters, and Toronto’s Jacqueline Harrison in the semis before beating Auld in the final. In Europe, Sweden’s Nilkas Edin bested Norway’s Steffen Walstad in the final of the Swiss Cup Basel. The win earned him the equivalent of $18,200 Canadian. Many of the top European women’s teams were playing at the Stockholm Ladies Cup in Sweden, which was won by Anna Hasselborg. Her Swedish team beat Russia’s Anna Sidorova in the final and earned roughly $15,000 CDN.